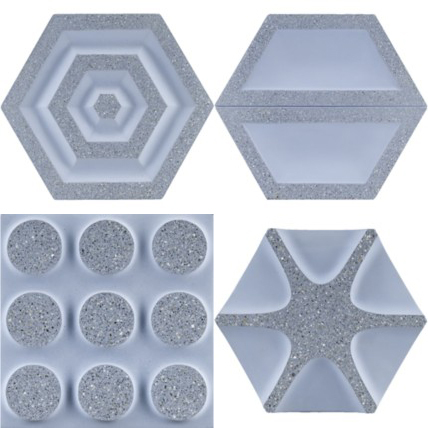 The tile in Andy Fleishman's Geode collection, clockwise from top left: Gemstone, Couplet, Spoke, and Circles. How does design happen? 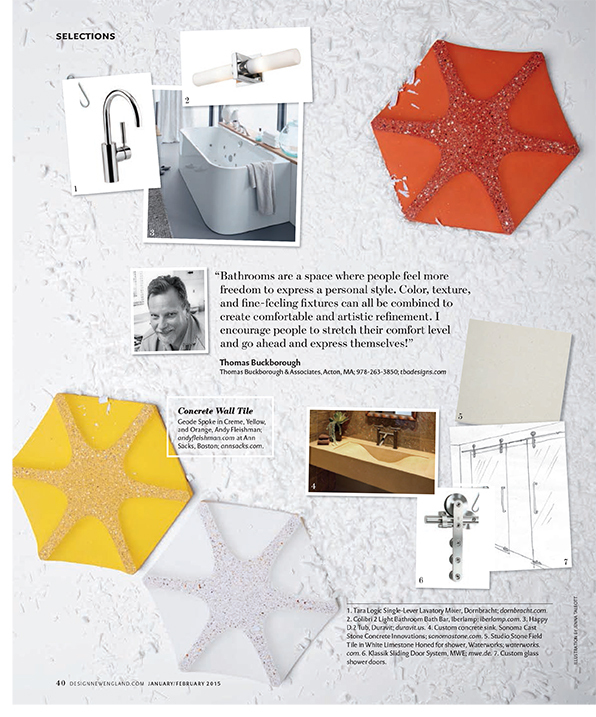 For the artist who created the concrete tiles for one of our Selections pages in the January/February 2015 issue of Design New England, it was a happy collision of art and science that yielded the gorgeous and unique wall tiles in his Geode line for Ann Sacks. 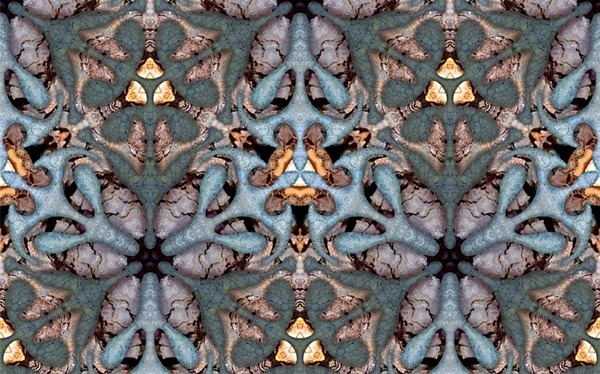 On his way to designing concrete floor and wall tile, North Carolina artist Andy Fleishman spent 10 years as a technical consultant at the Chemical Industry�s Institute of Toxicology. His work, developing casting and molding techniques in an effort to study the airflow in nasal passages, gave him the expertise he needed to realize his artistic quest of creating patterns that involved free drawing within a rigid geometrical system and turn it into a useful object. Thomas Buckborough of Thomas Buckborough & Associates in Acton, Massachusetts, used Geode�s Spoke, in three colors, to inspire his solidly masculine master bath design. The wall tile is simple with deep curved indents that make it both bold and sculptural. 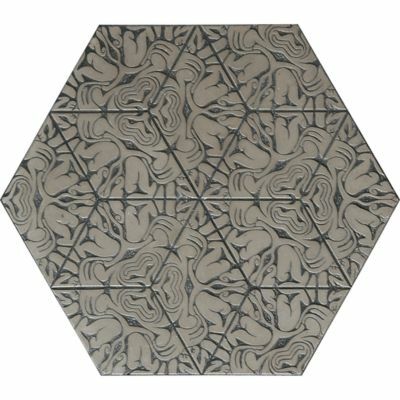 Fleishman, who has been designing for Ann Sacks since 2003, creates tiles that are both smooth and rough, with delicately etched patterns, usually floral-inspired, that meander organically and connect to each geometrical piece. When he began creating patterns years ago, he didn�t know the end use, but he says, �I believed that the basic ideas were strong and I would eventually find the proper way to use the art.� He carved one of his patterns into plaster and made a mold to cast concrete. 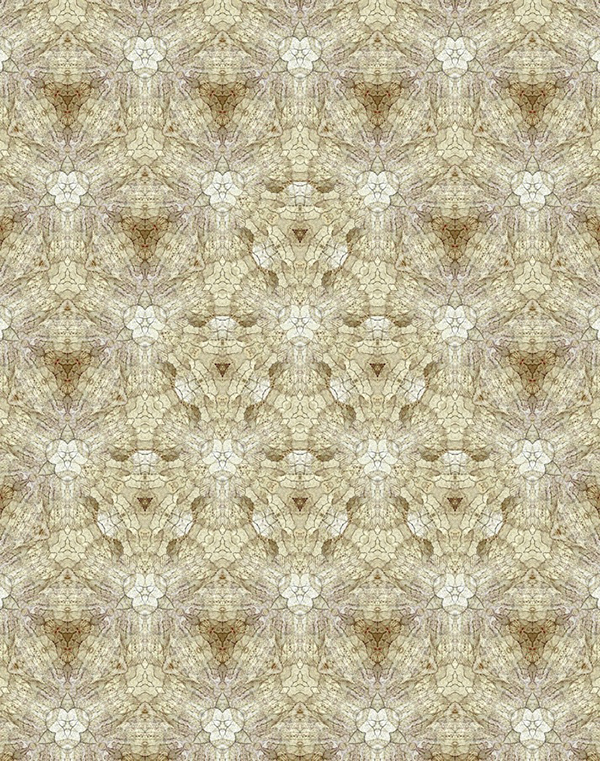 The idea turned into Maximus, a popular Ann Sacks tile now 12 years running. Maximus from Fleishman's first collection with Ann Sacks. Variations, another favorite from Fleishman's first Ann Sacks collection. Meanwhile, the science-meets-art project is still ongoing; Fleishman�s work continues to be used to develop new surgical procedures by scientist Kevin Morgan with whom Fleishman has co-authored papers and lectured on the subject of art and science. Now, Fleishman works predominately in his studio located between Durham and Chapel Hill, North Carolina, where he is close to three major universities. The engineering school at North Carolina State in Raleigh, for example, has an advanced concrete lab and �a generous extension program� says Fleishman. Outside of tile design, his artwork includes sculpture and digitally manipulated photographs and paintings. �I used close up photos I took for texture and color, but really created the work through drawing and Illustrator [software], but spent most of the time in Photoshop,� he says. �As I got deeper into it, moving the pixels around and changing their color was exactly the same as making sculpture.� He has been in more than two dozen group shows and 12 solo shows, and he�s had commissions throughout North Carolina, Florida, and New York. "Saint" (above) and "Stone Light" (below) are digitally manipulated photographs by Fleishman.